Kidney (renal) transplantation is a surgical procedure in which healthy kidney from a person (donor) is removed and placed in a patient (recipient) with irreversible advanced kidney disease (end-stage renal disease; ESRD). What are the types of kidney transplantation? Kidney transplantation is classified into deceased donor transplantation or living donor transplantation depending on the source of the donor organ. Can I undergo living unrelated donor transplantation? Living unrelated donor transplantation is not permitted by law; it is also unethical as it is associated with paid donation. Who are the patients for whom transplantation cannot be done? Patients with kidney disease that invariably recurs and damages the transplanted kidney (graft), recently diagnosed cancer, positive cross match (see below) and active infection cannot undergo transplantation. Who can be a voluntary kidney donor for living donor transplantation? Parents, children, siblings, grandparents, and spouse can be voluntary kidney donors if their age is between 18 to 60 years (upper age limit can be relaxed in demanding situations). Blood group of the donor should be compatible (well suited) with that of the recipient. The donor should be free from long-standing ailments that can affect kidneys in the course of the illness (diabetes mellitus, hypertension etc.) and should have two healthy normal functioning kidneys. They should not have an infection with blood-borne viruses (Hepatitis B, Hepatitis C, and Human Immunodeficiency Virus infection) and they should be psychologically stable to make a decision on kidney donation without coercion. What are the tests done for the donor? Apart from the evaluation for the above-mentioned issues, tests will be done to make sure that there are no illnesses affecting other major organs. Assessment of individual kidney function by radioisotope renogram (a scanning test done following intravenous injection of radioisotope), tissue typing (blood collected from the donor and the recipient are tested for the degree of tissue level compatibility) and computed tomography (CT) angiography (contrast material is injected intravenously to see clearly the blood supply of the kidneys; location and branching of kidney blood vessels will help in surgical plan) are the other tests required for donor evaluation. What are the risks involved in kidney donation? There is no increased risk of death or kidney disease in living donors in the long run. The donor is advised to have annual medical checkup to ensure proper care of single functioning kidney. What tests should be done for the recipient? d) Heart disease with coronary angiogram especially in patients who have diabetes mellitus and prior heart disease. How much time will it take to complete donor and recipient evaluation? What are the administrative procedures associated with living donor transplantation? The donor should sign an affidavit stating that kidney donation is voluntary and not by force (to be attested by notary public). You should get an approval letter for undergoing transplantation from The Authorization Committee of Organ Transplantation, Karnataka. Our Hospital front office in charge will guide you in getting all these procedures done. If you are not a native of Karnataka, you should get No Objection Certificate from your native state Committee before submission of papers to the local Committee. What should I do to get the approval letter from the Authorization Committee of Organ Transplantation? You should submit copies of all investigation reports along with a request form for kidney transplantation to The Authorization Committee of Organ Transplantation once all the tests are completed. The Committee will issue approval letter after verification of the documents (especially proof of relationship and residence) in two to three weeks’ time from the date of submission. What are the procedures after approval from the Committee? Date will be fixed for kidney transplantation if you do not have any active infection or other problem. Final tissue cross match will be done using donor’s and recipient’s blood 2 days prior to scheduled date of transplantation to make sure that there are no preformed factors in the recipient’s blood that can damage the graft. If the cross match is negative, you will be admitted that day evening and the donor, the next day noon. Immunosuppressive medications will be started and a session of hemodialysis will be done the day before transplantation. What will be done during renal transplantation? The recipient will undergo central vein catheter insertion (to monitor central venous pressure), urinary catheter insertion (to monitor urine output) and catheter insertion into the back (for injecting pain relieving agents) prior to surgery in the Operating Room (OR). The donor will undergo urinary catheter insertion (to monitor urine output) and catheter insertion into the back (for injecting pain relieving agents) at the same time. The kidney will be removed from the donor under anesthesia and brought to the recipient table. By that time, space will be created in the abdomen of the recipient in the area above the thigh to keep the new kidney. Then the donor kidney will be connected to the recipient blood vessels. When will the transplanted kidney start working? In almost all patients (95%), the graft will start its function immediately as evidenced by brisk urine output and progressive decline in serum creatinine (a blood marker for kidney function). Immediate function of the graft does not mean that everything will be all right thereafter. Kidney function may decline any time in the post transplant period (immediate and late) and that is why, constant and regular monitoring of kidney function using blood and urine tests is needed. What will you do if the graft does not function immediately? The cause for defective graft function will be analyzed by blood, urine and ultrasound tests and appropriate corrective action will be taken to improve graft function. In that process, additional procedures like graft exploration in OR and graft biopsy may be required and you may continue to require dialysis till there is improvement in graft function. There is a rare possibility (1%) that the graft may not function at all (because of complications in the blood vessels or severe rejection) and you will have to continue dialysis till you undergo transplantation again. Such grafts may require removal in OR to avoid serious life threatening complications like rupture of blood vessels or the graft itself. Will I require dialysis again after kidney transplantation? But for the above mentioned situations, dialysis will not be required post transplantation. When will the catheters be removed? The catheters will be removed in three to four days’ time for the donor and in a week’s time for the recipient (if there is no complication in the postoperative period). When will the donor and I be discharged after surgery? The donor will be discharged on fifth day and you, on seventh or eighth day (if there is no major complication in the postoperative period). Will you remove my diseased kidneys? The diseased kidneys will be removed only if they are seriously infected or the cause of severe hypertension or massive bleeding. What is the major requirement for renal transplantation? One of the requirements for kidney transplantation is blood group compatibility between the donor and recipient (see below). What are the advantages of live donation? The immediate and long term outcomes are much better for the recipient with the live donation. The cadaver organ wait list becomes shorter and the donor feels emotionally satisfied and gratified by donation especially if the outcome is successful. What are the disadvantages of live donation? Live donation involves psychological stress to the donor and his/her family, inconvenience (time involved and absence from work) and risks of evaluation (frequent blood testing, detection of new disease, risks related to donor angiogram etc). There may be postoperative surgical site pain and abdominal discomfort and occasionally wound infection or pneumonia. What investigations need to be done for renal transplantation if the patient is willing? For the recipient – It is necessary to ensure that the recipient does not have any reversible factor correction of which may help in temporary improvement of renal function. Apart from psychological evaluation and tissue typing, the recipient should undergo evaluation for a) the cause of the kidney disease if it is possible (to assess the possibility for recurrence of the disease in the graft and the timing of transplantation), b) lower urinary tract to rule out abnormal urinary outflow (they should be taken care before transplantation as they can predispose to post-transplant urinary tract infection), c) blood-borne viruses – if positive for viruses, they should undergo treatment for these viruses before transplantation and d) heart disease with coronary angiogram especially in patients who have diabetes mellitus and prior heart disease. The above assessment in recipient applies for all categories of transplantation. What other procedures are involved in living donor renal transplantation? The patient and donor should then submit relevant documents of proof for their relationship and nativity for approval from the competent authority (hospital-based authorization committee of organ transplantation). A meeting with the recipient, donor, their families and consultants will be conducted under video recording following verification of documents by the competent authority. During this meeting, the processes of donor kidney removal, transplantation and possible complications of the surgical procedures will be discussed by the consultants from the respective departments under video recording. Our Hospital front office in charge will guide you in getting all these procedures done. If the patient is not a native of Karnataka, either a No Objection Certificate from the native state Committee or residence (of the donor or recipient) authentication by local Tahsildar should also be submitted along with other papers mentioned above to the local Committee. Subsequently, the departments involved in the procedures of kidney harvesting and transplantation will have a meeting to analyze the scientific aspects of the procedures and plans of action to be considered. If there is no hurdle (active infection, heart disease, urological corrective surgeries), a date will be fixed for transplantation then. Final tissue crossmatch will be done using donor’s and recipient’s blood 2 days prior to scheduled date of transplantation to make sure that there are no preformed factors in the recipient’s blood that can damage the graft. If the crossmatch is negative, the recipient will be admitted that day evening and the donor, the next day noon. Immunosuppressive medications will be started and a session of hemodialysis will be done the day before transplantation. What options of transplantation are available if the patient’s family does not have a healthy or willing or blood group compatible living donor? Living related donor transplantation will not be possible if the patient’s family does not have an ideal donor (reasons may be small family, blood group incompatibility or family members having the same disease or some other disease that does not permit organ donation). If blood group incompatibility is the issue, living donor transplantation is still possible with paired organ exchange (swapping) or ABO incompatible (ABOi) kidney transplantation. Swapping is a process in which there is exchange of organs among blood group incompatible patient-donor pairs to facilitate blood group compatibility and transplantation. In this circumstance, transplantation for both the patients will happen simultaneously. ABOi kidney transplantation is discussed in detail below. The other option is deceased (cadaver) donor renal transplantation. Brain dead heart beating patients who are victims of head injury or stroke and who have non recovery of brain function with cardiac resuscitation following cardiac arrest are the potential cadaver donors. Numerous laboratory tests will be conducted to make sure that there is no chronic illness that involves the organs to be harvested. Patients with age above 70 years, severe hypertension, advanced cancer and blood borne viral and bacterial infection will not be considered for organ harvesting. What does blood group compatibility mean? Compatibility is a state in which two things can exist together without problems or conflict. An individual’s blood group indicates the type of carbohydrate structure (antigen; a substance that can trigger reaction and cause damage if injected into an individual not having this antigen) that is expressed on red blood cells, lining of blood vessels and other cells of the body including some of the structures in the kidney. The predominant blood group antigens are A, B and O; an individual’s blood group, based on the expression of these antigens will be A; B; AB (when the individual has both antigens) or O (when the individual does not have A or B antigen and has only the skeletal carbohydrate structure without the addition of extra carbohydrate structure as in A or B antigen). This blood group system (ABO system) is also defined by the presence or absence of naturally occurring antibodies (proteins that can react against antigens), referred to as isohemagglutinins; these antibodies are directed against the A and/or B antigens that are missing from the individual’s RBC. Antibodies to ABO antigens generally appear in the blood by four to six months of age following exposure to bacterial antigens that are similar in structure to the A and B antigens as the intestine becomes colonized in early infancy. Normal human body does not produce antibodies against self antigens. Group A individuals will have anti-B antibodies and group B individuals will have anti-A antibodies; antibodies to both A and B are found in an individual with blood group O, while an individual with blood group AB has no antibodies to A or B antigens. Is it possible to do renal transplantation across blood group? During the last 25 years, increasing organ shortage has resulted in the development of strategies to overcome the ABO antibody barrier. 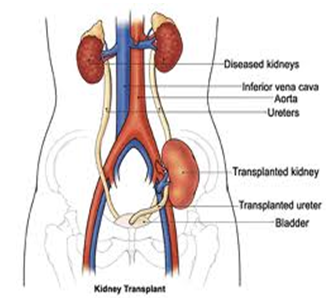 Presently in some countries especially Japan (where cadaver donor transplantation is not very active) ABOi kidney transplantation has become a routine procedure with reports of graft survival rates comparable to the rates in compatible transplantation. How do we manage with the naturally occurring antibodies? Once the level of isohemagglutinins is brought down to a certain value, we can proceed with transplantation. This process can take 1 to 2 weeks depending on the baseline value of these antibodies. The level of these antibodies have to be monitored during the first 2 weeks after surgery and plasma exchange may have to be repeated for a few sessions after transplantation if there is an increase in the level of these antibodies. Thereafter, even a rebound of these antibodies does not appear to harm the kidney transplant, a phenomenon that is called accommodation, but is poorly understood. What are the disadvantages of desensitization? The disadvantages of desensitization are the higher cost (the procedures mentioned above are very expensive) and high risk of infections that require extra care apart from rejection; with appropriate care and timely intervention, it is very much possible to minimize the risks and complications. ABOi kidney transplantation is definitely a boon to a recipient who does not have a blood group compatible donor and when the deceased donor wait list is long. How does living donor transplantation differ from deceased donor transplantation? Living donor transplantation is well planned whereas the deceased donor transplantation may happen anytime on an urgent basis; the waiting time for deceased donor transplantation is usually several months to years. In living donor transplantation, transplanted kidney starts function and forms urine immediately after surgery. In deceased donor transplantation, there will be a delay of days to weeks before the kidney starts function; these patients may continue to need dialysis and additional procedures like kidney biopsy (to look for superimposition of other problems like rejection) until there is improvement in kidney function. As tissue match is likely to be less, risk of rejection is likely to be more and the graft survival (time to requirement for dialysis due to irreversible loss of transplant kidney function; see below) is likely to be slightly inferior in cadaver donor transplantation; more powerful immunosuppression (with the associated risk of infection) at higher cost (additional cost of not less than INR 1.5 lakh at the time of transplantation) will be required to minimize the risk of rejection. What are the procedures involved in deceased donor transplantation? Once a patient is pronounced brain dead after evaluation, testing and documentation, consent is obtained from the family for organ donation if there are no contraindications for the same. Through the Zonal Co ordination Committee, a group of blood group compatible recipients high on the wait list are prepared to undergo cross match through their Nephrologists. Until the reports of cross match are ready, the organ donor is maintained on ventilator and medications and is stabilized with fluids. The surgical team harvests multiple organs from the donor in the operating room. They are then perfused with through special solutions kept under cold storage. The organs are allotted to the highest ranked recipients having negative cross match report and transported to the centers through which the selected recipients had registered for transplantation. What is the expected outcome of renal transplantation? Kidney transplantation is the treatment of choice for selected patients with ESRD. A successful kidney transplant improves the quality of life and reduces the risk of death for most patients when compared with maintenance dialysis. Survival rates post transplantation is similar for both hemodialysis and peritoneal dialysis patients. Survival rates are estimated for transplant kidney (time to requirement for dialysis due to irreversible loss of transplant kidney function) and patient separately. Post transplantation survival rates vary based upon the source of the allograft (living donor or deceased donor), patient age and the presence and degree of severity of co morbid conditions. One year and 5 year transplant kidney survival rates are around 95% and 75% for deceased-donor recipients and 97% and 85% for living donor recipients. A transplanted kidney may fail for various reasons of which kidney rejection, recurrence of original kidney disease, kidney side effects related to some of the immunosuppressive medications, some viral infections and not taking the medications regularly (non compliance) are the important causes. When there is transplant kidney failure, the patient returns to dialysis. What precautions have to be taken post transplantation? The recipients should come for follow up as advised during which time the patient would undergo testing for kidney function and side effects related to immunosuppression (risk of infection, derangement of liver function tests or kidney function tests, tremors, hair problems and other cosmetic side effects etc). The patient may develop diabetes mellitus, vascular disease (heart attack, stroke and gangrene), bone problems, urinary tract obstruction and recurrence of original kidney disease (which may or may not affect the graft seriously depending on the type of kidney disease) apart from side effects of the drugs anytime during follow up. As these problems can develop silently, regular monitoring is essential even if there are no symptoms or problems. However out of schedule visits may be needed if the patient develops fever, chills, cough, sputum, reduced urine output, burning urination, loose stools, vomiting, pain over the graft or unusual symptoms at any point of time. They can resume your work after 3 months of transplantation. A female transplant recipient anxious to conceive can plan pregnancy two years after transplantation if transplant kidney function is good and stable and there is no recent acute rejection. Couples should follow contraception (preferably barrier method) until this period. What are the risks involved in kidney transplantation across blood groups? ABO incompatible (ABOi) kidney transplantation was considered as one of the strongest barriers to successful kidney transplantation until a few decades back in view of the presence of naturally occurring antibodies. We consider individuals having pre existing or naturally occurring antibodies against a particular antigen as sensitized to that antigen. These antibodies can react with the antigens present in the donor kidney and cause a particular type of rejection (antibody mediated rejection) that can result in permanent loss of the graft function even before transplant surgery is completed.